I spent 18 months conducting dissertation research on music and politics in Belo Horizonte, Brazil in 2011 and 2012. Thinking back on a few of the performances that have touched me the most, I noticed an interesting phenomenon. In retrospect, perhaps it shouldn’t have surprised me. I have ended up performing far more American jazz—and unfortunately far less Brazilian music—than I anticipated. On the one hand, it has been infinitely rewarding to feel the genuine appreciation and warmth from audiences towards my jazz singing and improvisation. I have dedicated years trying to develop my own “voice,” in the sense of interpreting lyrics with conviction, but also in trying to develop my improvisational voice like any other instrument. On the other hand, sharing this part of my musical life with Brazilian audiences has kept me from learning more Brazilian music. That being said, my jazz performances did open new doors to me. The first open door actually came from a performance I did last summer in July 2010. Knowing I sang jazz, my roommate Ana invited me out one night to hear her cousin play a trio gig at a newly opened club called Nelson Bordello. From the outside, the club looked like a decrepit garage and, in fact, the entrance was through a metal garage door. But the interior had been renovated with a long skinny bar, simple wooden tables along the opposite wall, and ending in a small stage. Above the stage was a more intimate lounge with additional tables overlooking the first floor. 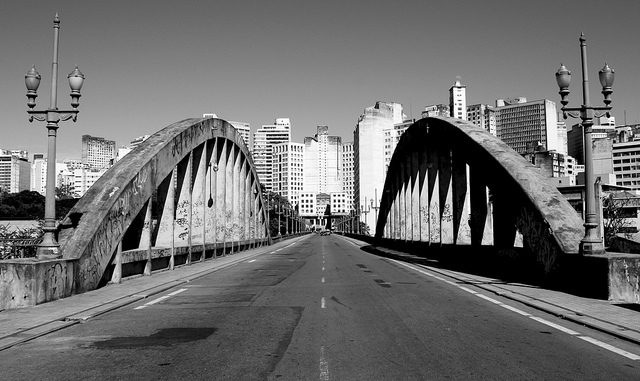 Tables spilled out the entrance onto the concrete underneath the iconic Viaduto Santa Tereza. The place was truly charming. Viaduto Santa Tereza in Belo Horizonte. Photo by Alexandre Costa. The trio sounded great. Ana introduced me to her cousin João Antunes and convinced him to let me sit in with them, much to my terror. I have never liked sitting in on someone else’s gig, or showing up to jam sessions. I am awful at remembering lyrics—a terrible affliction for any singer—so spur-of-the-moment performances are often stressful. Not one to back down from a challenge, I sang well. João and his trio even invited me back the following week. After a single rehearsal with João and bassist Trigo Santana, we had a fabulous time at the gig. João had also invited drummer Guto Ferreira—son of legendary drummer Esdras “Nenêm” Ferreira—and saxophonist Chico Amaral to join him. I was really touched by their dedication to learning my arrangements. I can remember feeling a buzz of nervous excitement before the show. The buzz was from having had such a blast with João and Trigo at rehearsal. There was no sense of just going through the motions—they gave their all every moment. The nervousness was my usual worry for how the audience would receive me, particularly as a foreigner. Before stepping on stage, each musician greeted me with such enthusiasm, I felt buoyed with positive energy. I stepped onto the tiny stage for sound check and began to unroll a little carpet I bought for gigs. For anyone who has ever worked on balance skills as part of a workout, you’ll know that balance is most difficult to do with your eyes closed. As a singer, I sing with my eyes closed almost constantly, and, though I have never fallen down, I have waivered dangerously in high heels while singing a particularly impassioned passage. Two memories of that night stick with me until today. The first is the transcendent feeling that set in almost immediately—every member of the band really listened. And it was contagious; the more they listened to me, the more I listened to them, eyes tightly shut, turning my smiling face towards the guitar, now bass, now drums, now saxophone, reacting to them reacting to me. I barely opened my eyes, but when I did, bright friendly eyes met mine. The other memory I’ll never forget was a comment from the drummer as I started to count of the Chick Corea tune “Sea Journey.” Though the audience was engaged with us, they were also drinking, chatting, and “feliz da vida [happy-go-lucky],” making it hard to talk to each other on the bandstand. As I counted off, Trigo asked the drummer Guto if he could hear me. Looking down at my bare foot, he replied, “Não, mas vou olhar esse pézinho aquí [No, but I’ll just watch this little foot here].” Ha! Sadly, my research grant ended just a few weeks later, and I left Belo Horizonte that August. I have never had the chance to perform with that great quartet since. But there would be other performances.